Ride4Will is a social ride for family, friends, and team and club mates in memory of Will Houghton. You will enjoy a very rideable (not many hills!) 25 miles around quiet roads in North Buckinghamshire, beautiful countryside and of course great company. We aim to get the ride underway by 10.30am and expect it to take two hours. 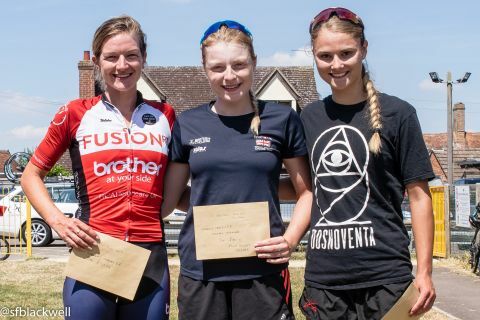 The Oakley Ladies Team Series Race, proved to be a tough seven lap circuit for many of the riders, especially with the heavy rain showers and steep climb before the finish. After just few laps the field was soon whittled down to around forty riders. Taking the first and second Prime was Annable Fisher riding for the Composite team. 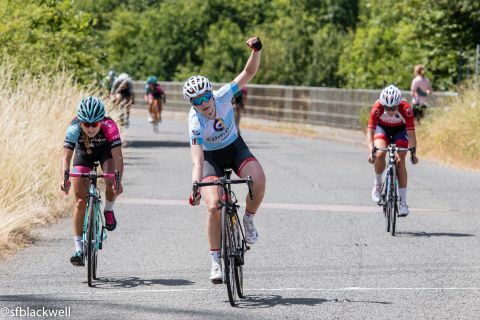 On the last climb the big attacks happened, Clemence Copie of Les Filles Racing Team and Jennifer Holden Fusion RT Fierlan, were the first to come around the corner at the top of the hill, side by side all the way to the finish line, Clemence Copie just taking the win. Annable Fisher was not far behind in third place. The First junior was Rachel Jary from VC Londres. Forename Surname Team/Club Memb. No. The Oakley Road Race was re named this year to the Will Houghton Road Race. Earlier this year Will lost his life whilst training on his bike. He was a passionate and extremely talented rider, who rode the Oakley Road Race as a junior and a second cat. He rode for Hillingdon CC and showed amazing potential. An emotional day for the Houghton family and everyone who knew him, a very poignant day. A total of £169.00 for the Hampshire Air Ambulance was raised by donations from both races. The Men’s Road Race started at a blistering pace on this seven lap circuit. Two riders broke clear on the first lap, one of them being Frazer Carr of RP Vision Racing Team, they were brought back half way through the second lap. Once again the riders were being dropped off on the climb but the main bunch remained around sixty strong. On lap three Richard Wood of TMG Horizon, broke clear and was soon joined by four more riders. They established a lead of thirty seconds and by the end of the third lap they were joined by five more riders making a breakaway of ten. George Pym of Raleigh GAC won the Prime on the third lap and the group had now stretched their lead to forty five seconds. Over the next few laps they increased their lead to a minute and a half. Joe Harris of Spirit Racing, attacked the bunch to try to bridge the gap, his attempt failed as were many attempts. RP Racing took control of the last lap in the bunch and brought the break down within sixteen seconds, but a bit too late to catch them before the finish. On the finishing climb two riders in the finishing group, one being George Pym and another rider collided giving the chance for the other seven riders to contest the finish amongst themselves. George Fowler of NFTO Pro Cycling, proved to be a worthy winner powering in twenty meters clear with Thomas Scott-Collins of Wellingborough Cycles Race team and Richard Wood of TMG Horizon Cycling Team coming second and third. The bunch soon followed in after, John Mulvey being ahead of affairs. First Junior was Elliot-Haigh of Team Milton Keynes and the Second Junior was Jacob Tresham of Team Corley.